​Team up with Solana Energy to develop a Renewable, Distributed Energy Asset. Get your project underway today. 2019 is the last year of the full 30% Investment Tax Credit. ​Your building tenants send $ to the local utility. Why not you as the building owner? Team up with Solana Energy. Visit Transform.Energy - the repository of know-how for water and power solutions. Team up with Solana Energy Today. Progressive societies in record numbers are putting solar on their rooftops. Seems like a good thing. ​Of course it is, but there's a problem. At dusk, the System Grid Operator (ISO) has to ramp up sources of energy required to continue to run the grid's unmet load running into the evening. It's called the Duck Curve. Here's how it looks in California. A: The Water Generation Array with capacity depending on the array size from 10,000 to 10,000,000 gallons per day. Requires electrical input. B: Elevation from the source of the water catchment or tank farm to the base of the vertical tunnel. C: The hydroelectric turbine producing electricity when there is an energy imbalance during the day. D: The water supply for the local community and ecology. To reach 100% penetration of clean energy, consumers and producers leverage abundant storage materials like Water, Hydrogen, and Vanadium. Implement more pumped hydro-electricity to balance intermittent resources (Pending Patent above). At the commercial scale, produce ice during the day for refrigeration and air conditioning. The Transform Energy Asset incorporates software technologies that run the compressors and store juice by freezing water and charging batteries. After dusk, stored energy is dispatched to meet loads. Ice maintains cooling. Produce hot water during the day for evening and early morning showers. 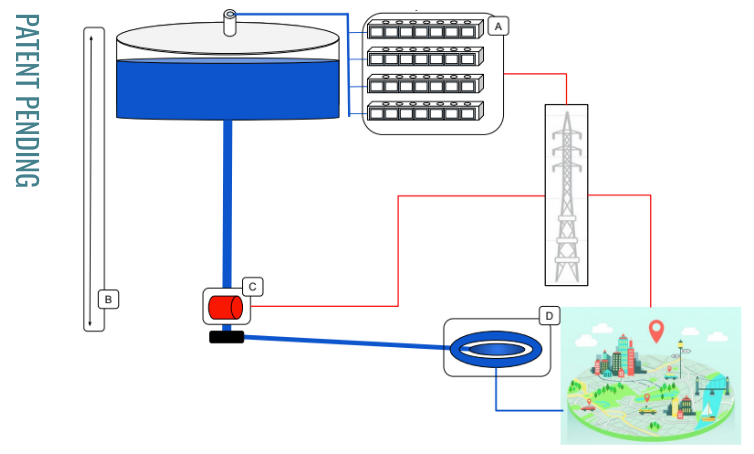 Reform waste flows and brackish water for hydrogen. Governments, utilities and community energy districts can stimulate 100% adoption of renewables by expediting the permitting of these technologies enabling a 100% emission-free economy.